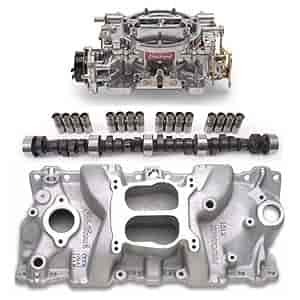 Designed for street 1955-86 262-400ci Chevrolet small-block V8s. Not for 1987 and later cast iron or Chevy Bowtie heads. Will fit 1987 and later stock aluminum heads. Has provisions to add oil fill tube. Performers accept late-model choke, waterneck, air-conditioning, alternator and H.E.I. This intake is for 302, 327 and 350ci V8s with OEM or Edelbrock (350-1400) 4-bbl. carb. ; 1966-72 (1973 non-California) passenger cars, 1966-83 trucks and Suburbans; except stock equipped EGR.Intake p/n 350-3701 is for 305, 350 and 400 V8s with OEM 4-bbl. or Edelbrock p/n 350-1400 carb. 1972-86 and GM corporate engines with 350 V8s; 1981-86. Use EGR adapter 350-8035 to adapt clamp-on EGR valve. Choke plate 350-8901 is included. use Automatic Divorced Choke Rod 350-9171 and throttle bracket 350-8036 for 1972-78 vehicles. Edelbrock Performer 600cfm Carburetor 350-1400.
carb acceptable to factory cruise control. use throttle bracket 350-8036 for 1972-78 vehicles. Edelbrock Performer 600cfm Carburetor 350-1405. Edelbrock Performer 600cfm Carburetor 350-1406. Edelbrock Thunder Series AVS 650cfm Carburetor 350-1805. This kit will fit on your engine, the numbers will not make a difference on this. This kit is compatible with the 283. However, the oil fill will have to be machined open in the front. Does this kit come with any bolts or gaskets? No, this is for the 3 main components, look at part number 350-2101K for additional installation items.